A simple fruit slot with a limited set of bonus features, but with a potential for big payouts. The biggest excitement in Burning Hot can come from the Expanding Wild on the three central reels. 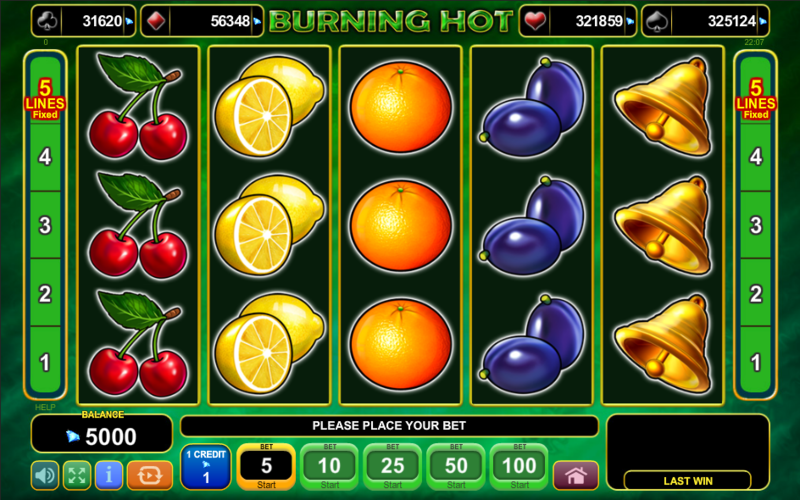 Burning Hot is a video slot coming from EGT with a simple design and fruit symbols which give it a classic fruit slot appearance. Still Burning Hot is a modern slot with a rich paytable and a potential for big payouts. More importantly the game also has four attached jackpots which players can win randomly on any given spin. This is a fruit slot with the recognizable fruit symbols on the reels which are common in classic slots. But the EGT designers gave them an attractive appearance by using vivid colors and modern animations. The combination of the two gives Burning Hot an eye candy looks and makes the game fun to play. The gameplay in Burning Hot is fast and exciting. The regular game symbols can land stacked across the reels and players can get a full screen of matching symbols, with a big win on the screen. To make the gameplay even more exciting, the designers added an Expanding function to the Wild symbol, so you can easily get a full stack of Wilds on the three central reels. 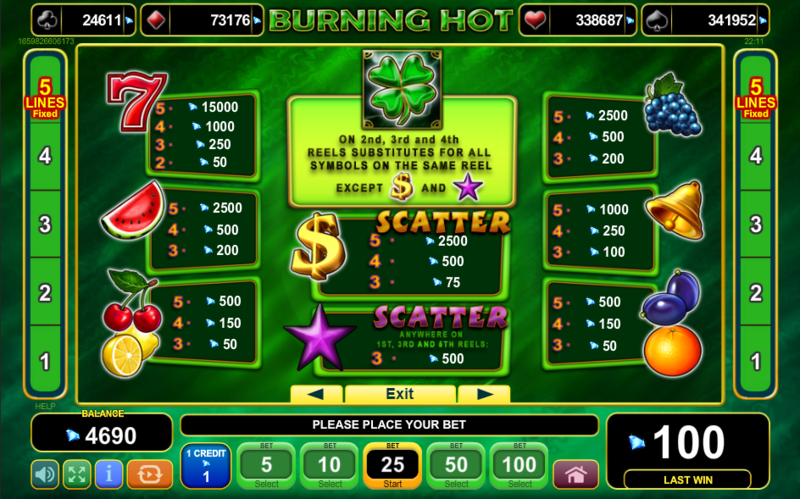 Burning Hot is a simple 5 pay line slot with 5 reels and 3 rows. Players can place bets ranging anywhere from $0.05 up to $300 per spin. The top payout in the slot can come from the Red Sevens symbol set at 600 times the total stake for landing 5 of them on a winning pay line. The game comes with a medium to high variance and an RTP value of 96.45%. This is an average RTP value compared to most modern video slots. Burning Hot is a very limited slot when it comes to bonus features. The Wild symbol can land only on reels 2, 3 and 4, substituting for all symbols except for the Scatters. When a Wild lands on a reel, if it can contribute to a winning combination, it will expand to cover the entire reel. The game also has two Scatter symbols. The Dollar Scatter can land on all of the reels awarding a top payout of 100 times the total stake if 5 of them hit the screen. The Star Scatter can only land on reels 1, 3 and 5 awarding a payout of 20 times the total stake. The jackpots in the game are awarded randomly when the Jackpot Cards Mystery Bonus is triggered. 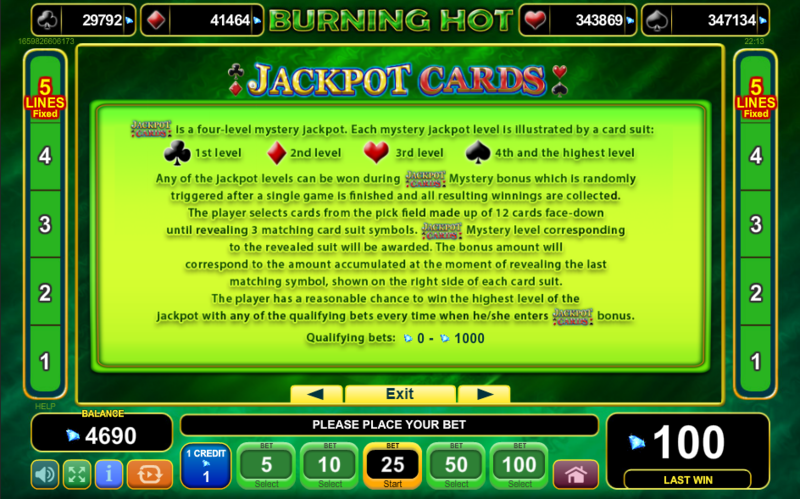 The player will need to make picks among 12 face-down cards and once three of them are matched the corresponding jackpot is awarded. 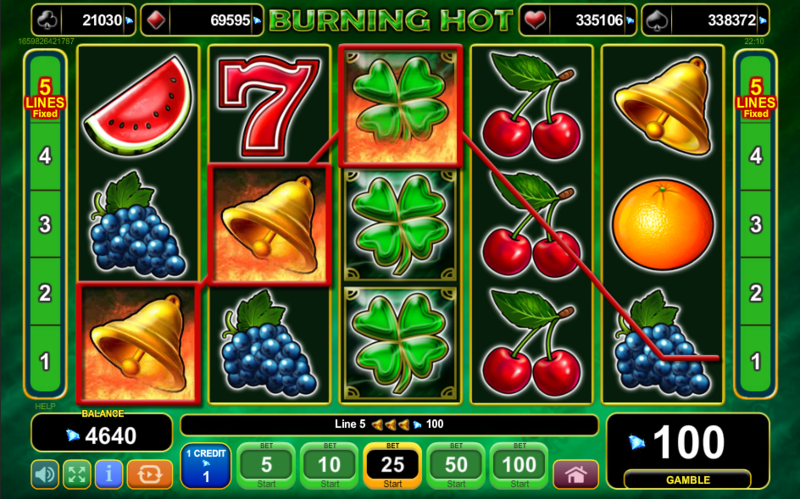 Burning Hot is a video slot which will definitely catch the attention of all fruit slot fans. The game comes with a simple 5 pay line design, but with a potential for big payouts. The paytable in the slot is rich and players can get up to 3 Wild Reels on the screen. Even though the game comes with two Scatter symbols, none of them triggers a bonus feature, which is a bit disappointing. Still if you like to play simple video slots which can pay big, Burning Hot is the right game for you.